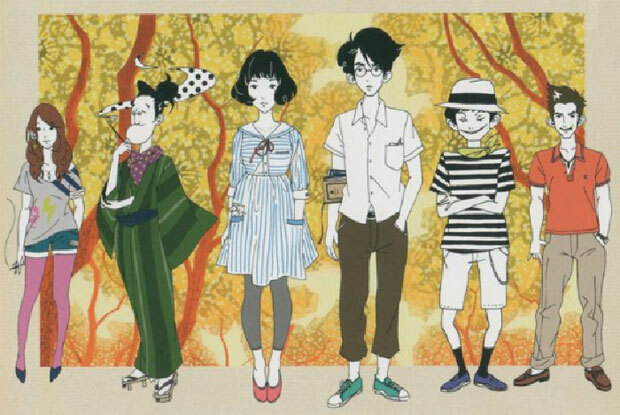 The Tatami Galaxy is absolutely amazing. I don’t know how to describe it better than that. It exceeds expectations in every way. The theme music is rather catchy, the drawn characters and environments at first appear to be rather poorly done, but then the artistic side to this form is brought out, they are able to use all kinds of trippy effects and colours while they attempt to display the inner workings of the main character (he doesn’t have a name). The plot follows a simple train of thought which is easy to grasp after the first few episodes. The protagonist is 2 years into college, and the story is based on his remembrance of his time at college, the club he joined, how that has affected his life and how it has compared to his original dreams of what college would be and his desire to meet a girl. He always falls off the wagon in some way or another, ignoring the girl that seems to like him. He meets the same main characters every time he rewinds time, travelling down a different choice of club and the change in his lifestyle that would come from these differing decisions. He is completely unaware of previously knowing the characters, except for some small recognition of the fortune teller, which always provides a humorous section of each episode. Eventually he begins to have some success with girls and other aspects of his life; however he never ends up happy even when he is deciding between the 3 loves of his life, all the while the constant of Akashi floats along in his background, even though he never acknowledges it. After the first few episodes I was enjoying this series so much, I almost forgot my main criticism that I had to begin with. When I initially started the series, I was heavily opposed to the quality of drawing (see it below), however I was soon to be slapped in the face for my stupidity as I realised the amazing capabilities that they could use it for. It seemed extremely 2 dimensional, and the characters didn’t seem to have a connection to their surroundings and the background. My other criticism was the insanely fast subtitles. When the series arrived, I went to play it, then I had to quickly do some tasks for University, my father came in telling me it was hard to keep up with the subtitles, but I just brushed it off considering he doesn’t like ordinary subtitles. How wrong I was in ignoring him, I can speed read, and could not keep up with how fast the subtitles are flashing up, they are trying to keep up with the fast paced speech of the protagonist, and it is almost impossible to read when you first begin, I had to pause it quite a few times to read the subtitles, often every 5 seconds, but as the series progressed and I watched more and more, I found I was finding it easier to read them, however I still found myself missing lines, but it was never enough to detract from the plot. A lot of the stimulation comes from visual reactions within this story anyway. I highly recommend this, it was just so intriguing, and it also provides satire and humour with so much variety, it doesn’t have the issue of many anime where they repeatedly use the same joke or running gag and the gag becomes old and becomes annoying rather than adding humour to the piece, the constant changing humour makes each new episode a refreshing watch.